As per the National Highway Traffic Safety Administration, more than five million drivers are involved in auto accidents each year. Even more troubling is the fact that distracted driving plays a role in many of them. Estimates suggest that anywhere from 10-60 percent of accidents are caused by people taking their primary attention off the road, and that number is likely to rise as hand-held devices become more and more common. So how can you protect yourself while you're operating a moving vehicle? What are the big distractions that you need to avoid? Here are just eight of the most common ways that you're risking yourself on the road. Texting The enemy of drivers everywhere, texting has become one of the biggest causes of fatal car accidents worldwide. This is especially true for teenagers. A recent AAA study estimates that as many as 21 percent of teen auto accidents were because of texting! If you're the parent of a young driver, make sure that they realize how dangerous it is to use their phone while operating a vehicle.
. Smoking You already know that it's bad for your health, but were you aware that it's also bad for your driving? 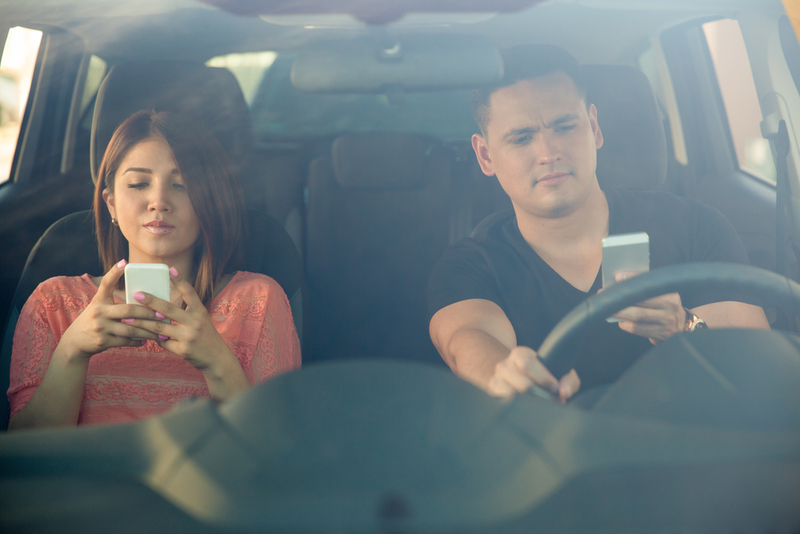 Think of all the distractions that you face when you're smoking behind the wheel. You must fumble with your lighter and get it going. You should flick your ashes in the ashtray. You must stub it out when you're done. These tiny distractions may not seem like much, but it only takes a split-second to cause a car accident.
. Pets Put Fido in his carrier the next time that you're driving home from the vet. It may seem cruel since he loves to stick his head out of the window, but you're doing it to save both his life and your own. It's very common for drivers to be distracted by the barking, hissing, pacing, sniffing and roaming pets that they have in the backseat. If you're serious about eliminating distractions, bring out the carrier and give your dog an extra treat for being a good boy. Eating and Drinking Most people would rather die than skip their morning cup of Starbucks, and if that's true for you too, you should know that death is the very risk you face when you eat and drink while driving. If you simply can't wait until you reach work to indulge in something tasty, at least save it for red lights and traffic stops. Don't hold your snack in one hand when you know good and well that you need two hands to drive effectively. Reading While less common than sending texts or making phone calls, reading is still a problem for people who drive with gadgets. They might be scrolling through their phone to read their emails, for example, or they might be checking the instructions on their dashboard GPS. If you want to avoid a preventable accident, don't be like these people. Tear your eyes away from your digital screens. Save your reading for street signs. Dashboard Controls Speaking of GPS systems, they cause more accidents than you'd think, so do other things on the modern dashboard. Every time you take your eyes off the road to fiddle with the radio, air conditioner or windshield wipers, you run the risk of causing or failing to avoid a collision. Remember, it takes less than a second for a car accident to change your life forever. Other Occupants If you've ever had a passenger who just wouldn't shut up, you're probably already aware of how dangerous it can be to have a distracting occupant in your car. You'll need to get honest and direct if you want them to stop with their troublesome ways. Say something like, "I'd love to discuss this with you when we're back at the office, but I need to pay attention to the road right now. I'm a cautious driver. Sorry!" Losing Yourself in Your Thoughts Finally, the overwhelming reason for most car accidents is a simple loss of focus. You stop thinking about the road and start thinking about work, school, kids, romance, dinner or something else entirely. It will take some effort to break this habit, but there's no time like the present. The next time you feel yourself "zoning out" during your commute, snap yourself back to attention. If you make it a regular occurrence, you'll eventually train your thoughts not to wander at all.